The frame structure uses the tight tension bar, and the slide uses eight guide rails, with good rigidity and high precision. The hydraulic control system uses cartridge valve integrative system and fat liquor cooling system, delivering reliable movement, long life, small hydraulic shock, and reduced connecting pipeline for less leaking point. The independent electrical system with a compact structure is reliable and convenient to maintain. It uses the PLC control, with the adjustment and semi-automatic operating modes. Through operation kneading board choice, it may realize the constant pressure and fixed range of travel. The single action hydraulic stamping press has welded steel frame which is given high temperature tempering treatment to ensure high precision sizes. Meanwhile, the single action hydraulic stamping press is designed with new type of cylinder sealing elements to offer reliable and durable sealing performance. 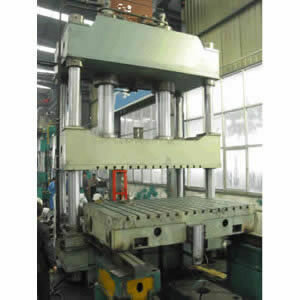 Rugao Yaou Company is an experienced manufacturer of oil drilling equipment and hydraulic press. We have attained the certificate of the American Petroleum Institute (API). With many years of experience, we know how to produce reliable and economical petroleum equipment, rolling machines, hydraulic presses and so on. These products are characterized by high quality, stable performance, and long life. Hence, they are in great demand in America, Germany, Russia, India, Singapore, just to name a few. If you have a need for our products, please let us know. You can contact us by phone, fax, or email.